As reported by the US operators, supplemented by some reasonable solid estimates on my part. The iPhone had around 47% share in Q2, roughly level with Android (RIM is now very small in the USA). 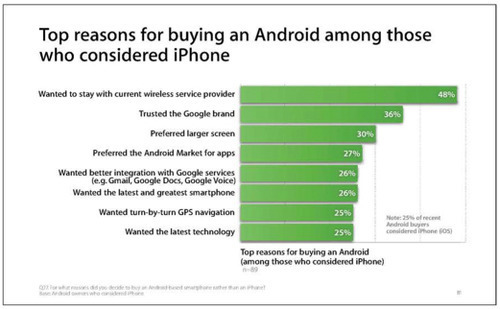 2 years ago the iPhone was only offered by AT&T, which had 30% of the market. Today it is offered by operators with 80%. 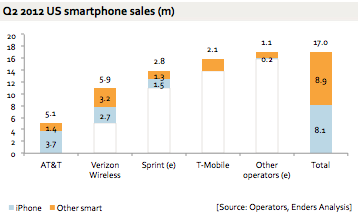 I strongly suspect that the iPhone ‘5’ will be ranged by T-Mobile (whose spectrum has been reconfigured, making this more practical): all things being equal that would take it slightly over 50% market share. This is especially relevant in the light of this internal Apple survey, disclosed today as part of the Apple/Samsung patent lawsuit: people choose operator first and phone second, especially in the US, given the highly variable coverage that operators provide.